When it comes to symbols, nothing represents the Celtic heritage like the clover and shamrock. The clover and shamrock have been part of Ireland for centuries. 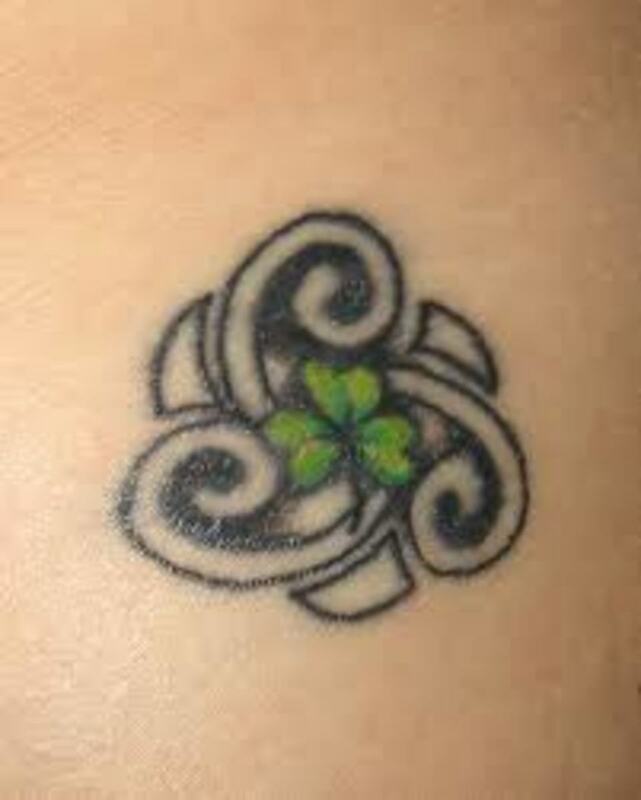 In the tattoo world, nothing represents that heritage like a clover or shamrock tattoo. The four leaf clover tattoo is a symbol that is very well known around the world. As most of us already know, the four leaf clover is rare and very hard to find. There is a difference between the clover and shamrock though. The clover has four leaves and the shamrock has three. Both of them also has different meanings. 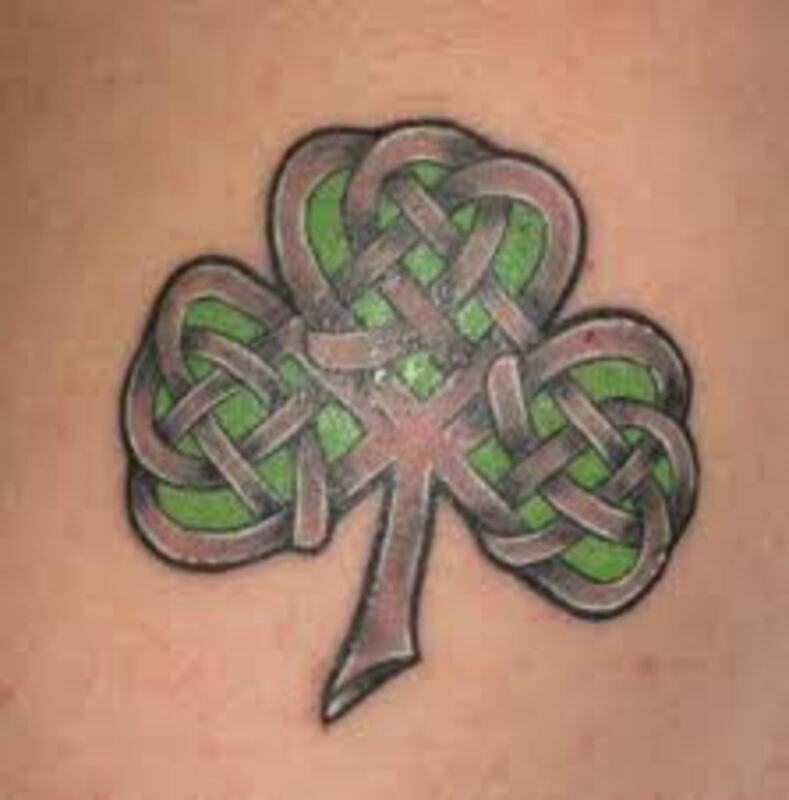 Due to the popularity of Celtic tattoos, clover and shamrock tattoos are often done in Celtic knot-work. Although the four leaf clover is popular among Irish tattoo wearers, it is also a symbol for good luck. On average, there is only one clover found in 10,000 shamrocks. This is where you get the definition of "being lucky" if you find one. The four leaf clover and shamrock tattoo can be done in a variety of different ways. This is another example why it is a popular design. As lucky tattoos go, the four leaf clover is the most popular. Each leaf on the four leaf clover has a symbolic meaning. The first leaf on the clover represents hope. The second leaf represents faith. The third leaf represents love. The fourth leaf represents luck. On these four leaf clovers, you will usually see the meaning inside the clover or on the outer edge of each leaf. Other ideas for these tattoos may include the clover with hope, faith, love, and luck underneath. 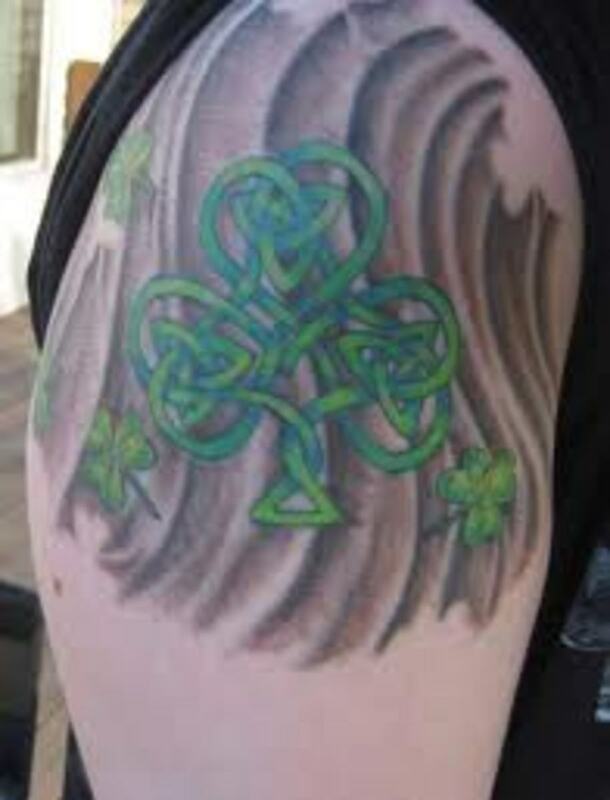 The tattoo on the right is an example of a Celtic shamrock. 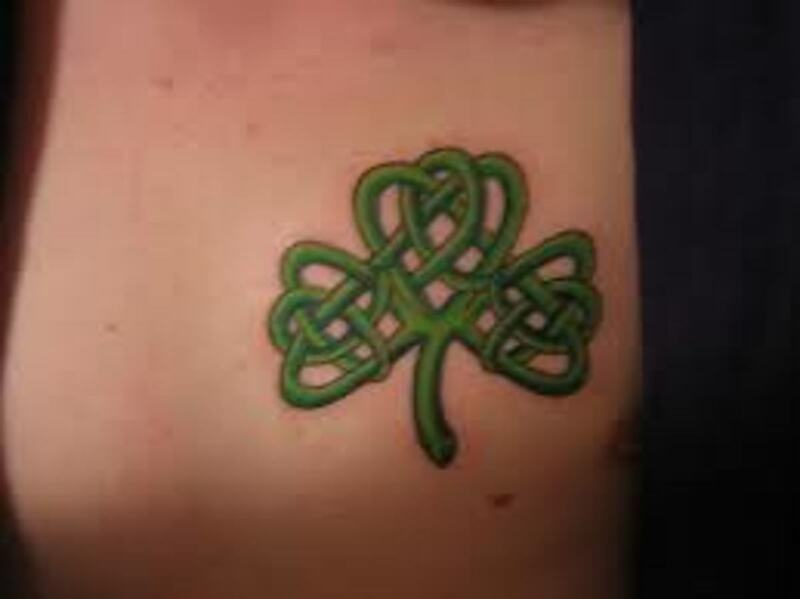 You will usually see Celtic knot-work in most clover and shamrock tattoos. 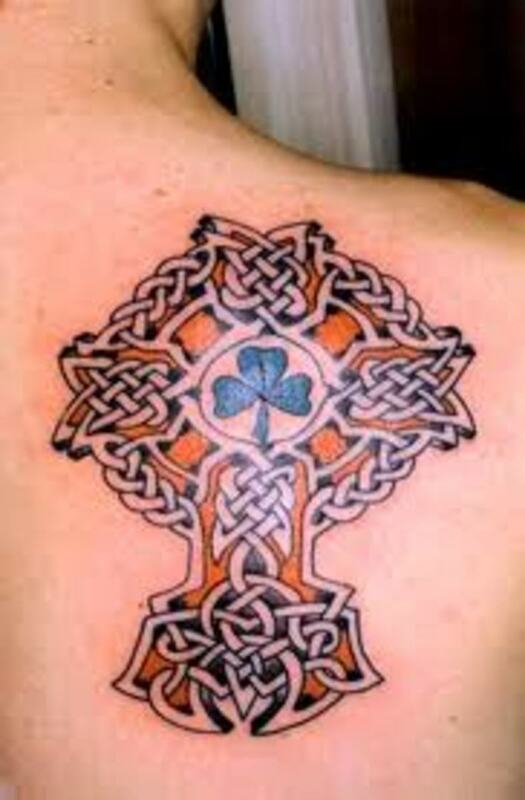 Celtic knotwork tattoo designs are commonly portrayed with the clover or shamrock. This is a nice pattern for this design. If you are looking to add a large shamrock, this would be an ideal design. 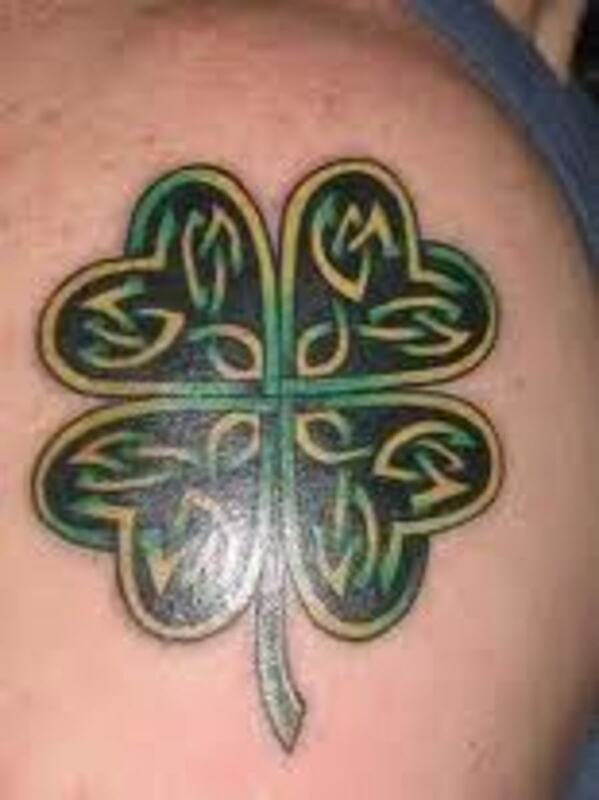 You can see the tattoo artist added a few extra shamrocks and a background to the total design. The shamrock is a form of the clover. It only has three leaves. The shamrock was considered sacred centuries ago by most ancient Celtic cultures. The shamrock has always been popular and became a symbol of Ireland. Shamrocks and clovers have represented the Celtic culture for centuries. 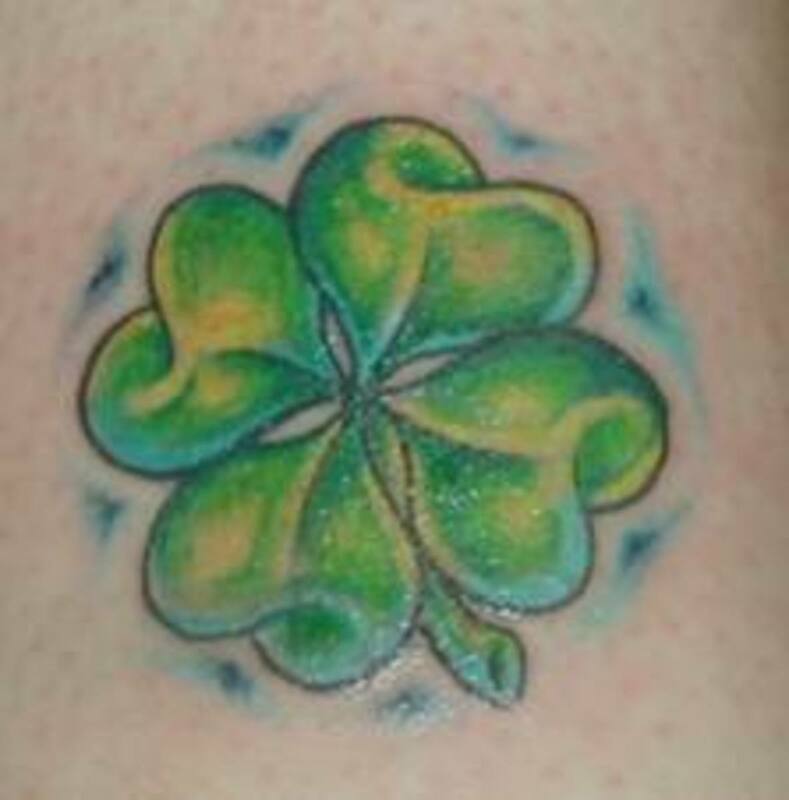 If you have Irish decent, you may want to consider a clover or shamrock tattoo. 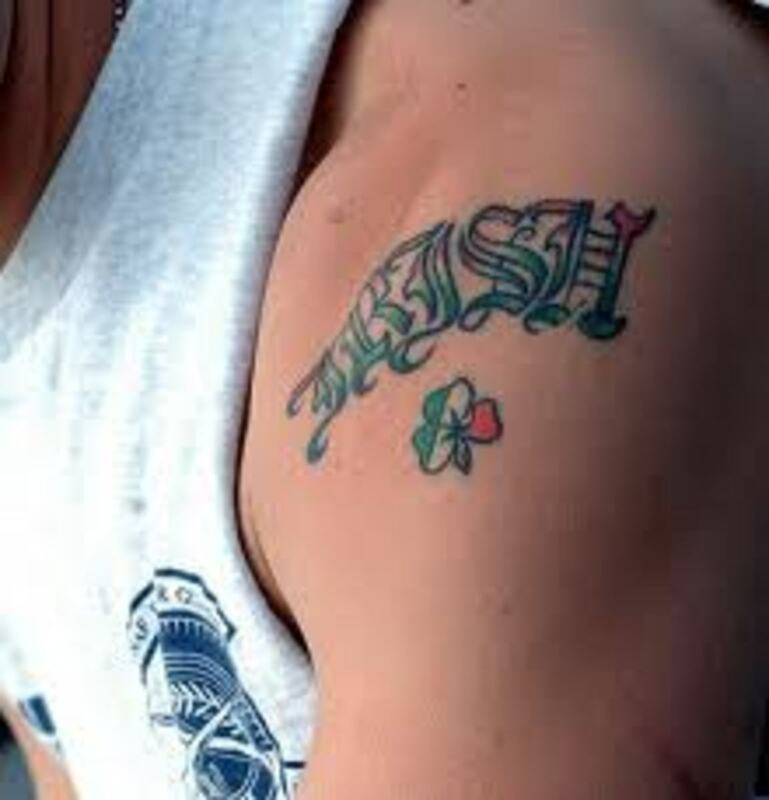 The shamrock tattoo represents life. During early Celtic Christian times, it symbolized the hope of new life after resurrection. Although the shamrock tattoo isn't a religious tattoo, it can represent being reborn. 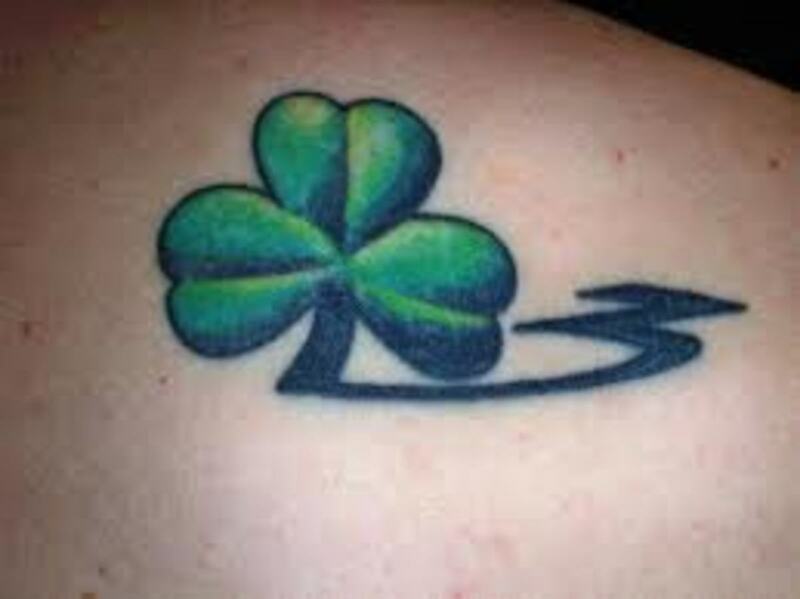 Another reason men and women might wear the shamrock tattoo is to represent life in general. They may enjoy life and have a positive outlook on life. 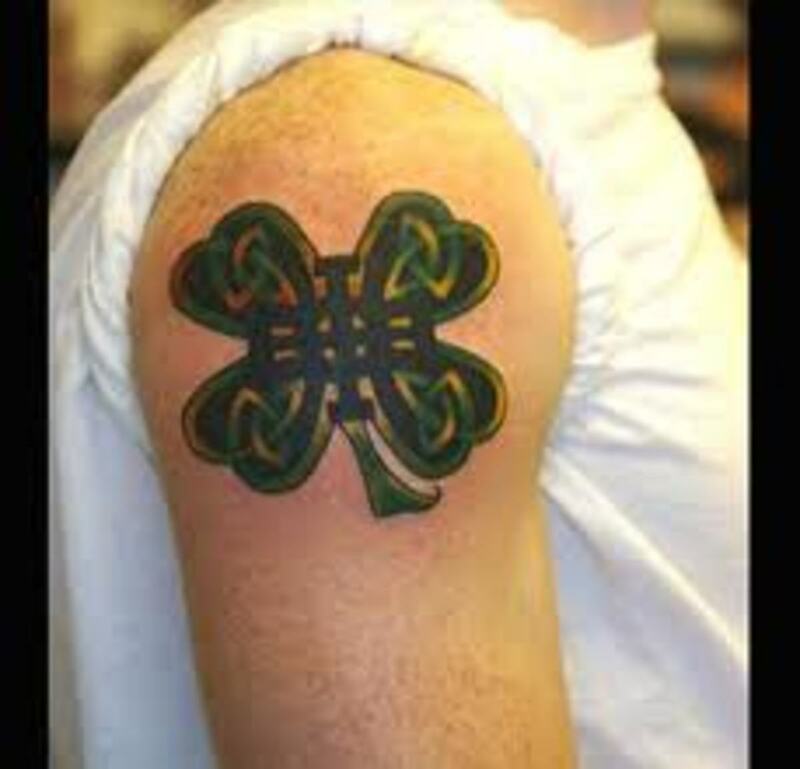 The shamrock tattoo can be worn for heritage, but it can also be worn to represent anything that revolves around life. The tattoo on the right is a ladybug tattoo, but it also has clovers in it. I wanted to use this tattoo as an example. This tattoo shows you a different way to represent the clover. In most cases, the clover or shamrock is a single tattoo. 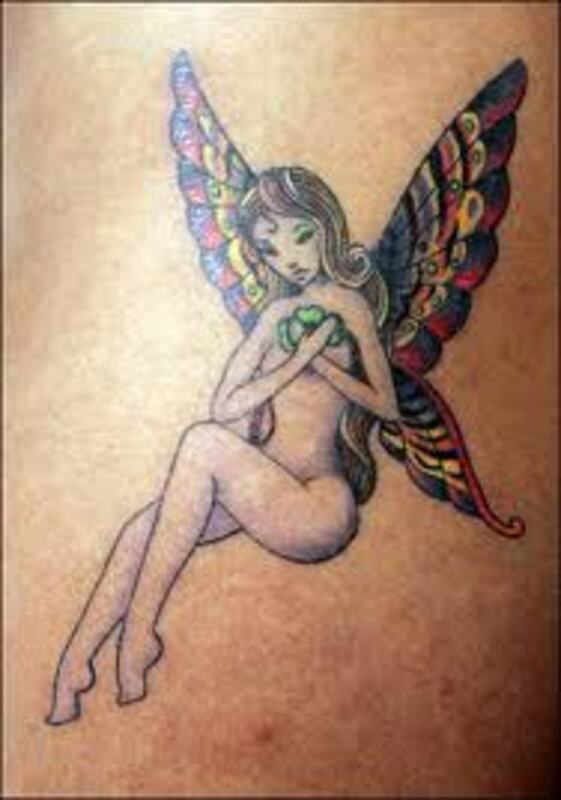 This shows how other images can be added to your clover tattoo. 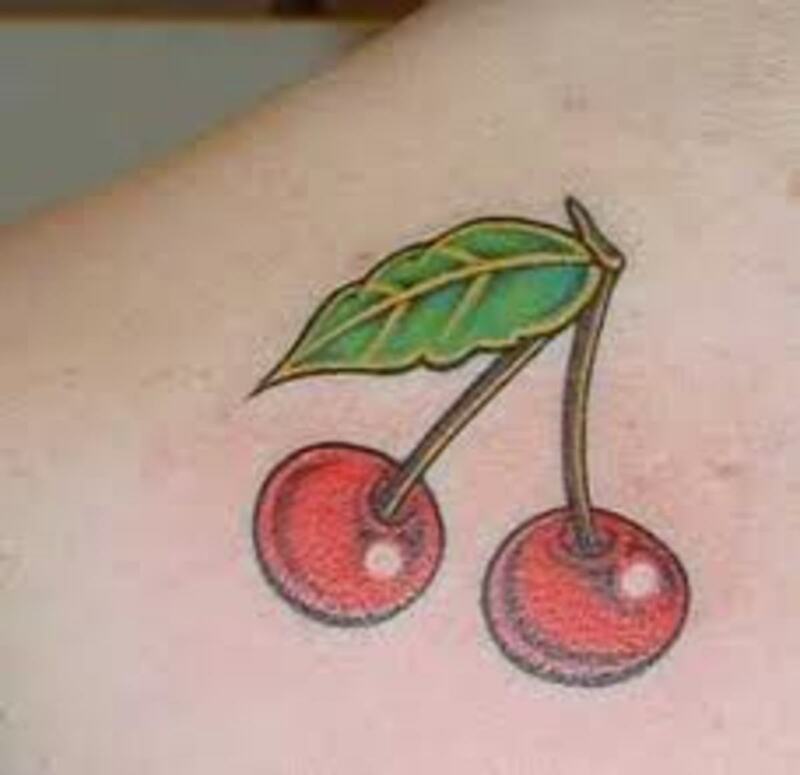 Of course, this would be a female tattoo. 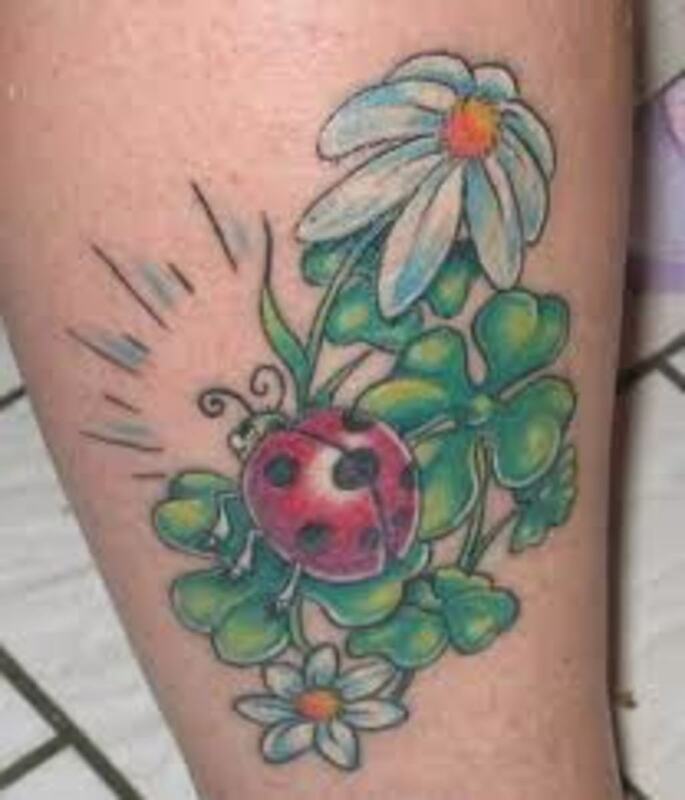 The main point is to see how other images can be added to clover tattoos, in this case, the flower and ladybug. 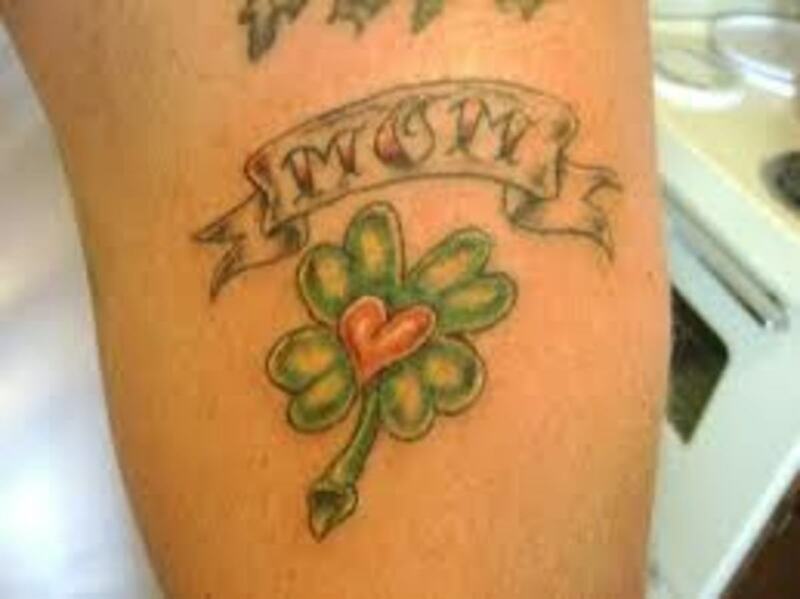 This tattoo on the right shows another popular way that clovers and shamrocks are often used. The clover and shamrock are often used in this manner. 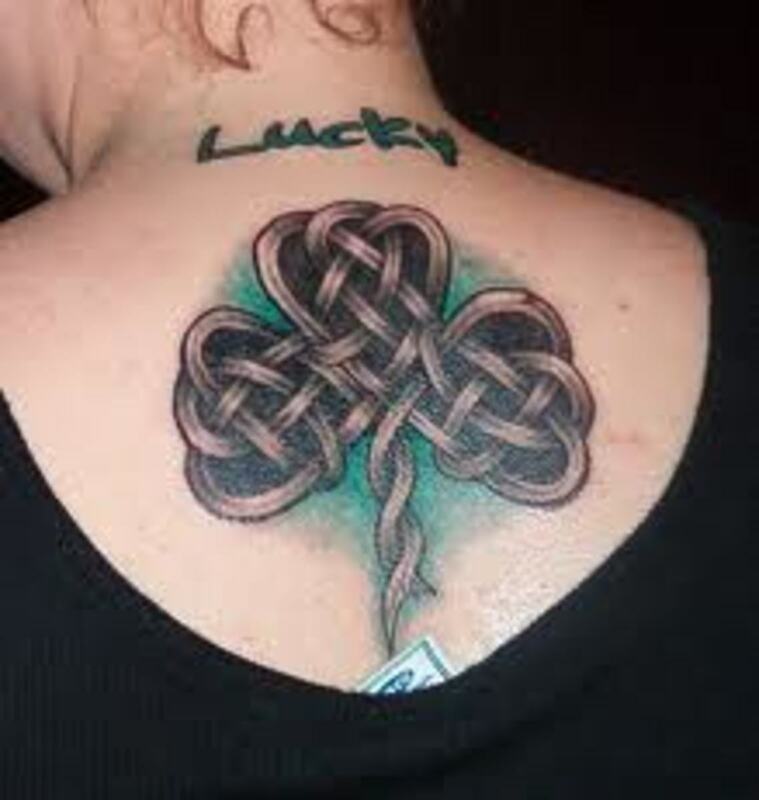 In this tattoo, the clover is in the middle of the knot-work design. They are also found this way in Celtic crosses and other Celtic art. You already know that clovers and shamrocks are green. 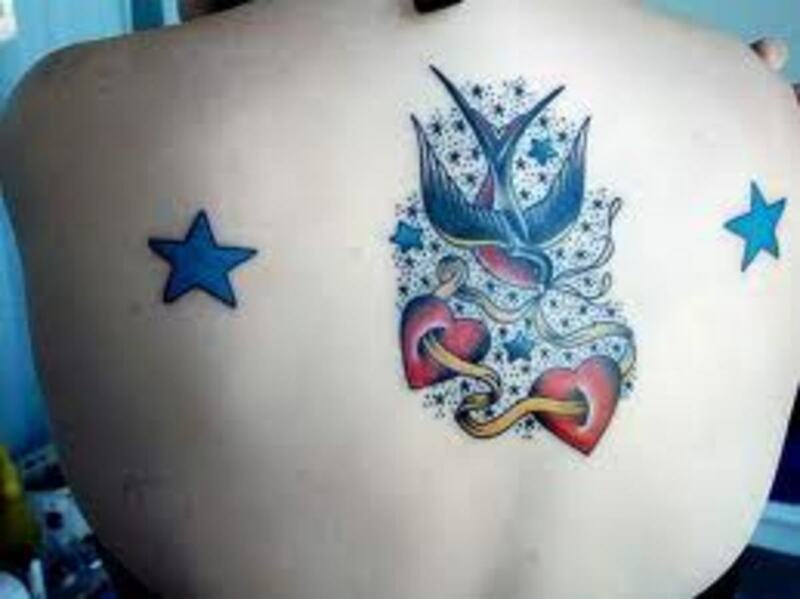 Just like the tattoo on the right, this gives you an option to add color into the design. 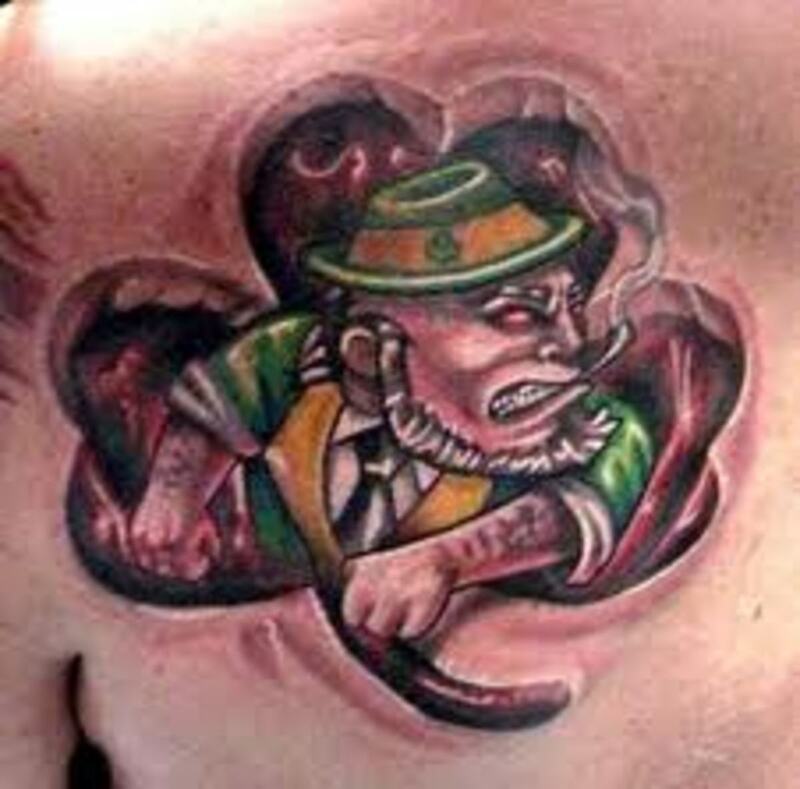 The tattoo on the right shows another way to use the shamrock tattoo. 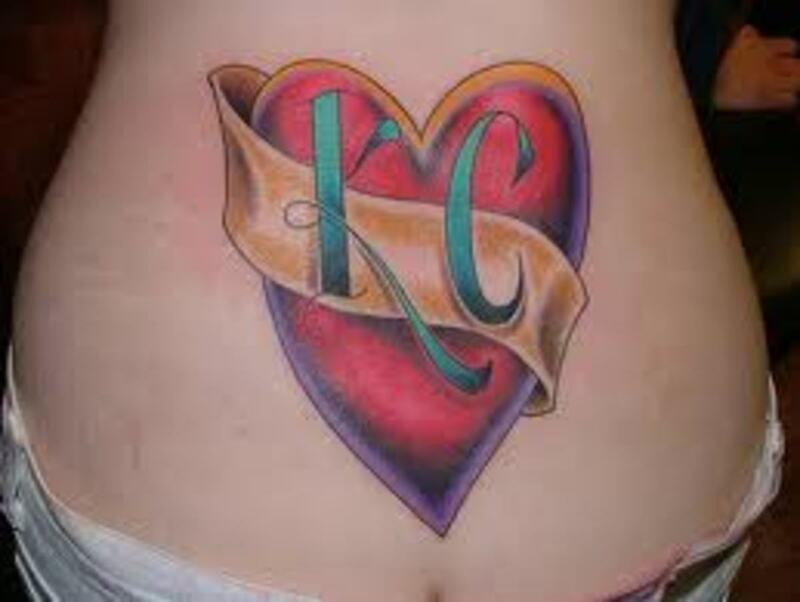 This would be a female tattoo and it is located on the back. The shamrock and clover tattoo can be tattooed in a variety of different places on the body. It can also represent different meanings as well. With such tattoos, you can be creative and you have plenty of choices. The tattoo on the right is another female design, but it gives you a concept on how we portray "luck" in a tattoo. Most of us already know that the four leaf clover represents "good luck". 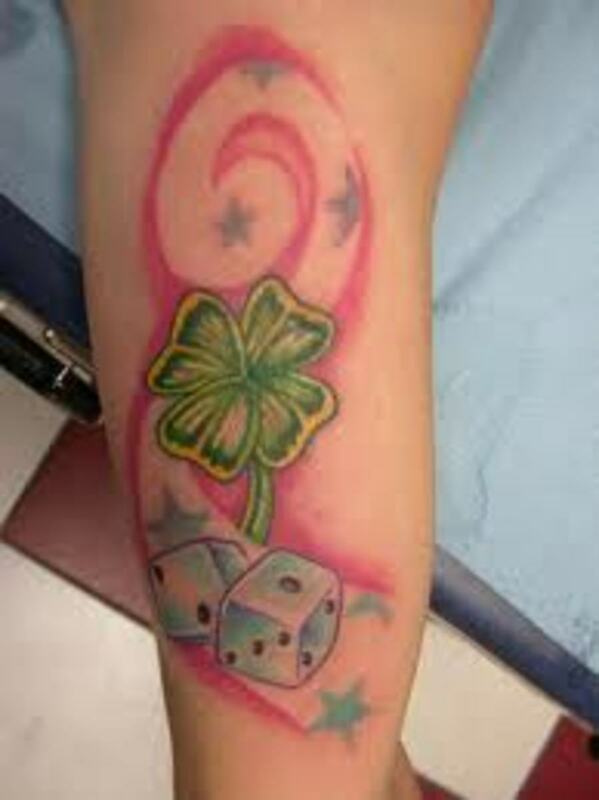 This tattoo can represent good luck or it can also represent a gambler. Have you heard the old saying, "luck of the dice"? This tattoo can represent that. I just wasn't you to get an idea of all the option you have if you choose the clover or shamrock design. With this tattoo, you can see how the vibrant colors really set the tone for the overall image. In this case, stars, dice, and a tail is used. This tattoo would be a male tattoo. This one is the four leaf clover done in Celtic art. As you can see in the inages on this article, there are a vast variety of these clovers done in different styles and patterns. The Celtic clover represents hope, faith, love, and luck. The four leaf clover also represents luck and has been a symbol of luck in many different cultures. The clover and shamrock tattoo can be used in many different ways, styles, and designs. This is one of the main reasons that is is popular. Most of us have already heard of St, Patrick's Day. St. Patrick used a shamrock to illustrate the basic concept of the Holy Trinity. This is the main reason that the color green is associated with the holiday. And since then, the shamrock has always been associated with the Holy Trinity. Tribal art is also used in many clover designs. Tribal clovers are done in traditional tribal art or the clover can be centered in a tribal design. The tattoo on the right is an example of a tribal clover. Tribal tattoo designs don't commonly portray clovers, but it does work. 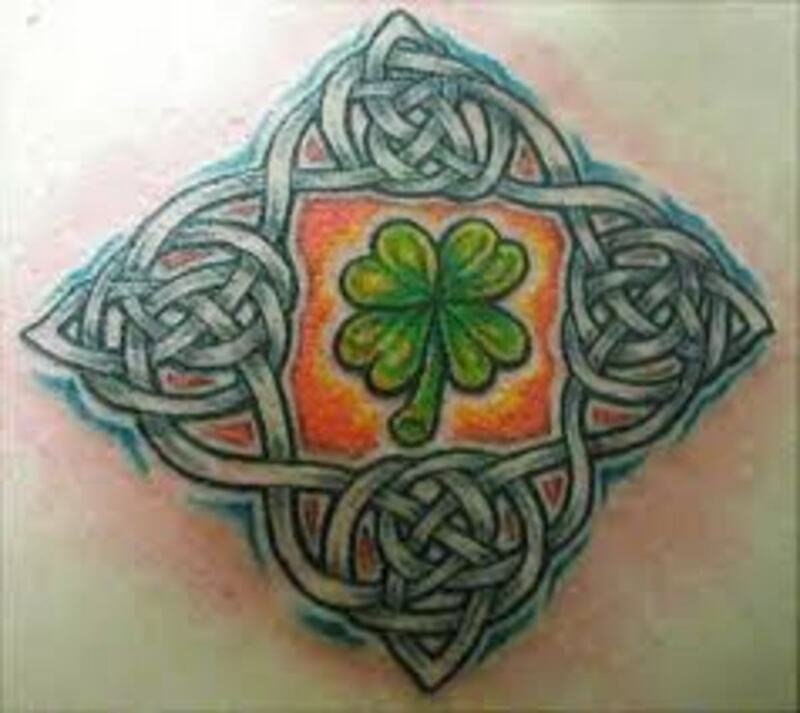 Although tribal clovers are not as popular as Celtic clovers, they do offer another different style that you can use for the clover in a tattoo. 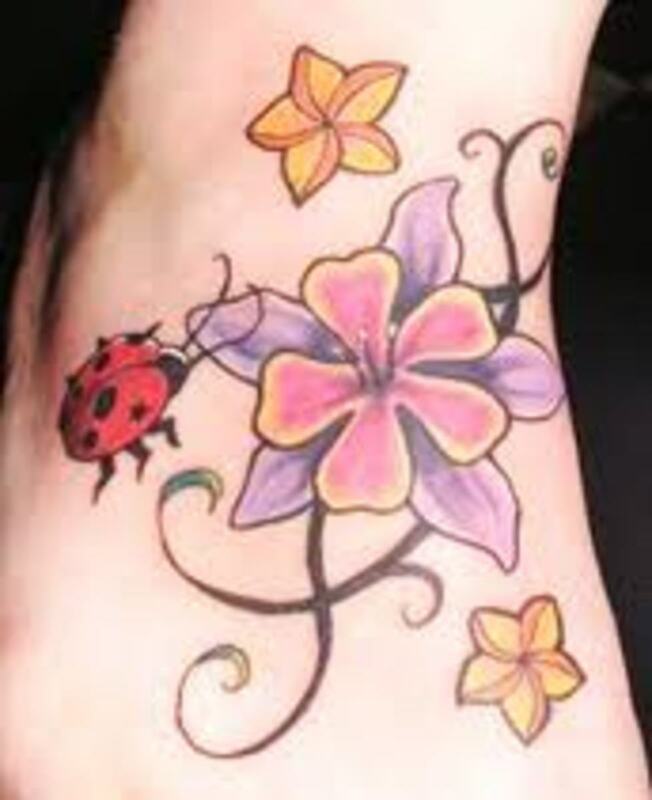 As I already mentioned, there are many different aspects that you can apply to a clover tattoo. If you creating your own image, try thinking outside the box and being creative. If you are trying to find a design, just make sure you do your research and look at all possible ideas. 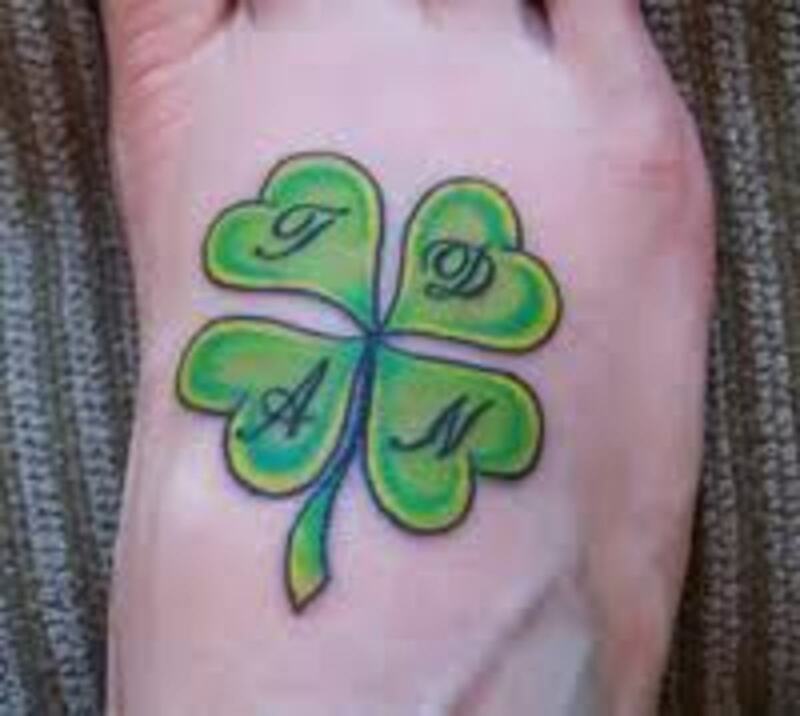 This tattoo is another example of how clovers and shamrocks can be centered into a design. This is a shamrock centered into Celtic art. This is a very well designed tattoo by the tattoo artist. 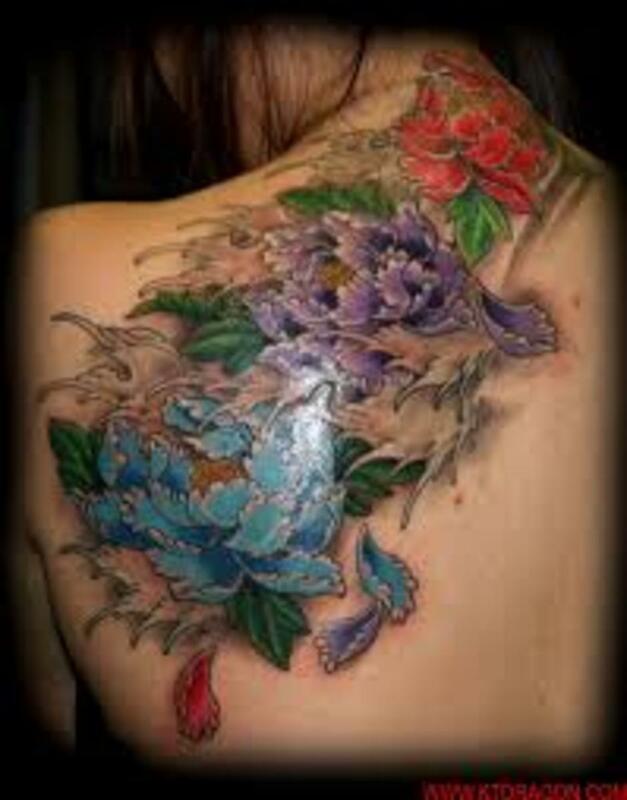 The color tones on this tattoo work well together and it is a great back shoulder tattoo. 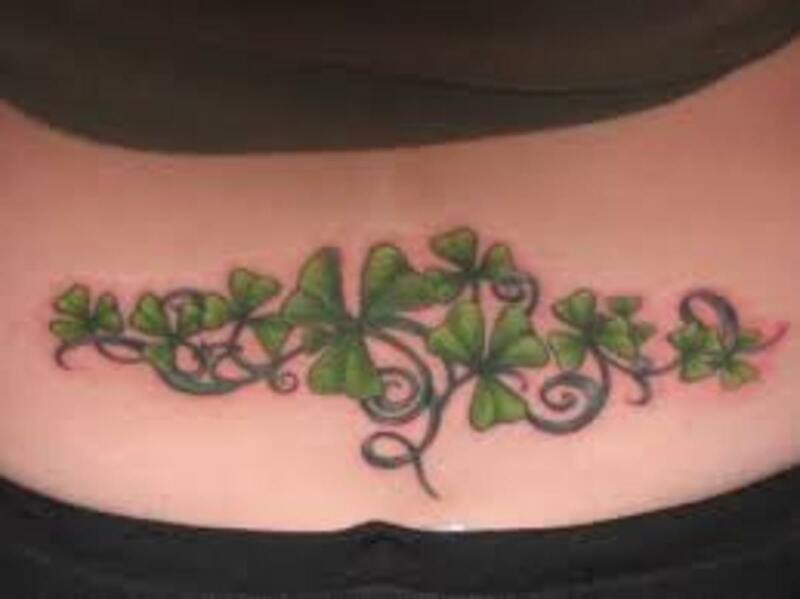 The back shoulder is a popular place where males and females get clover and shamrock tattoos. Just like the Celtic cross, this is a design that places the shamrock in the center. 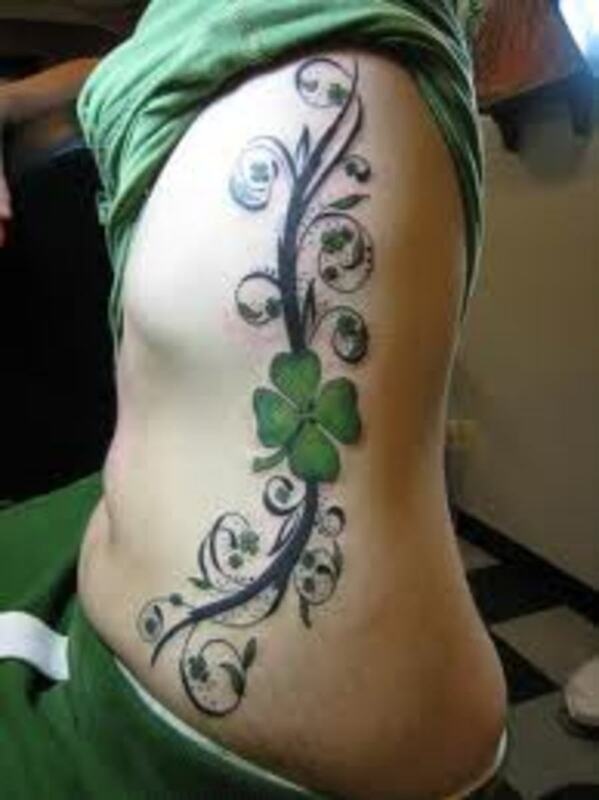 This shamrock tattoo could be used on a female or a male. On this tattoo, the green and black work very good together, more then one would think. 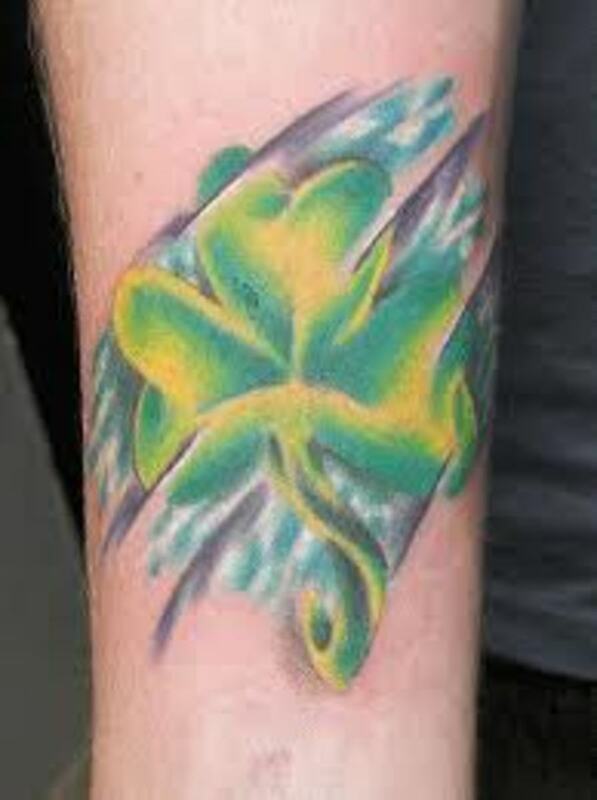 The green glow behind the shamrock really sets this tattoo off. It looks like this tattoo represents "good luck". 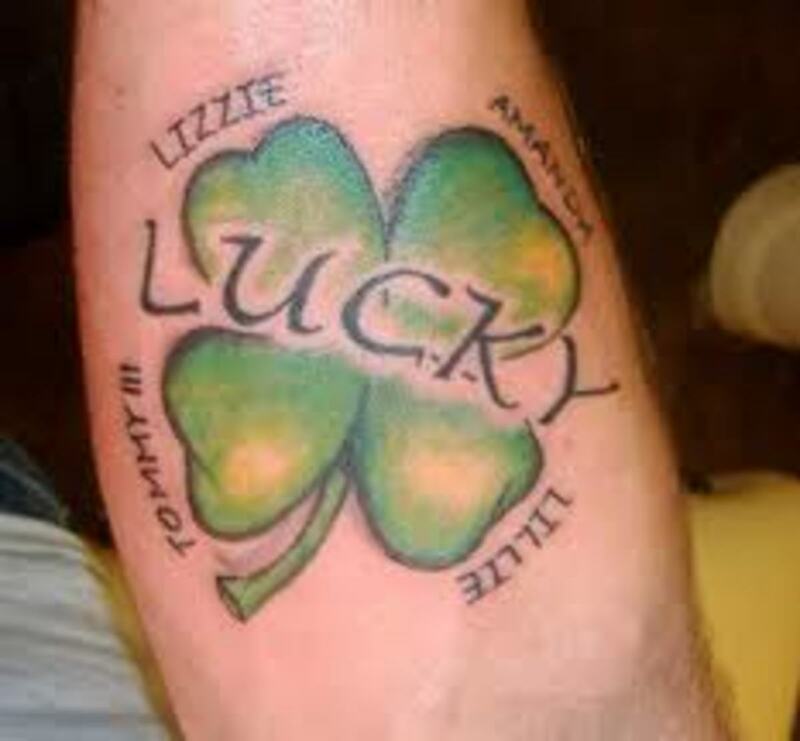 Lucky is written above the shamrock. This is just another example of how these clover tattoos are used to represent an overall meaning in most cases. The leprechaun is a popular character in Ireland and across the world. May of us have heard or known them from famous stories and fables that originated from Irish cultures. The leprechaun represents everything Irish. They are often associated with four leaf clovers. Both the clover and leprechaun are a sign of good luck. It is believed that if you capture a leprechaun, then they have to take you to their pot of gold. It is said that they are very hard to capture. 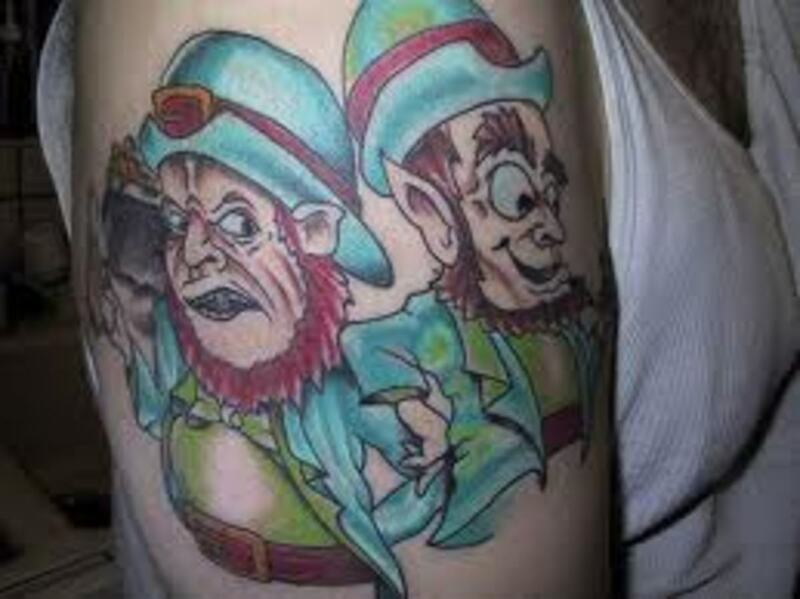 In many leprechaun tattoos, you will see them with gold, rainbows, clovers, and shamrocks. 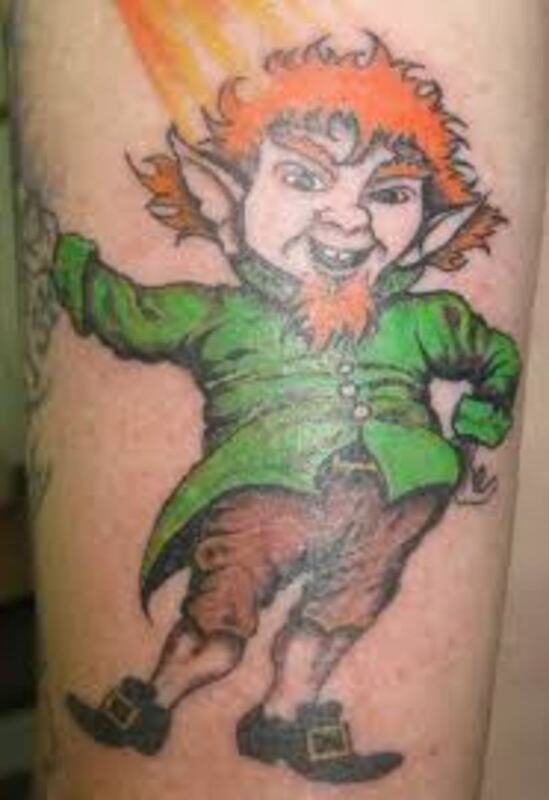 People that choose the leprechaun tattoo get it to represent that they love everything that is Irish. 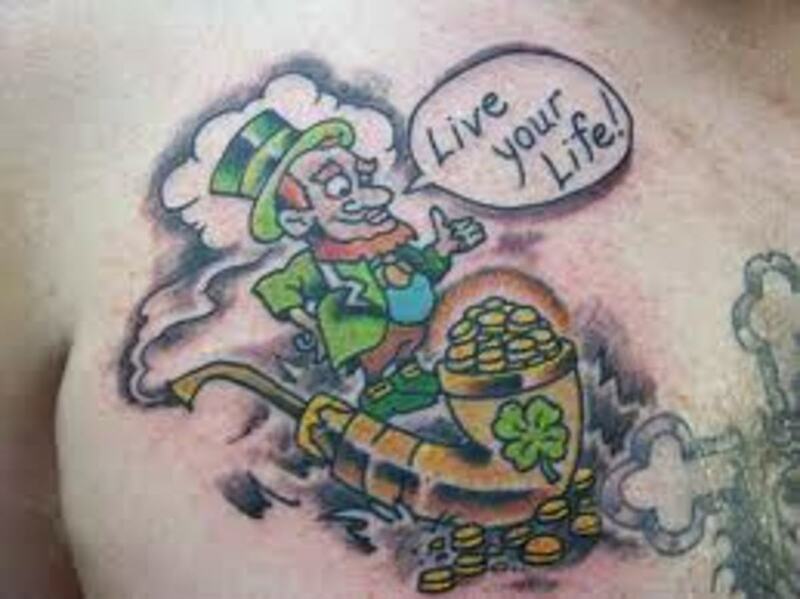 Some people choose to get the leprechaun to represent their Irish culture and heritage. The leprechaun is often getting in trouble or seeking mischief. They are often portrayed for their mischief, love of alcohol, and for picking fights. 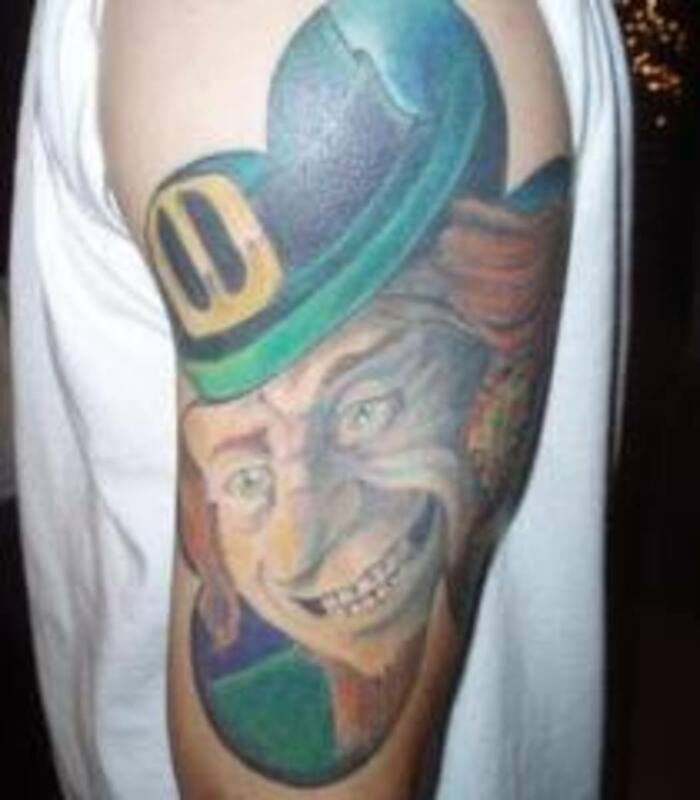 Most of these tattoos have the leprechaun with their fist raised. They are also seen doing mischievous things, such as pulling their pants off or doing other mischief. 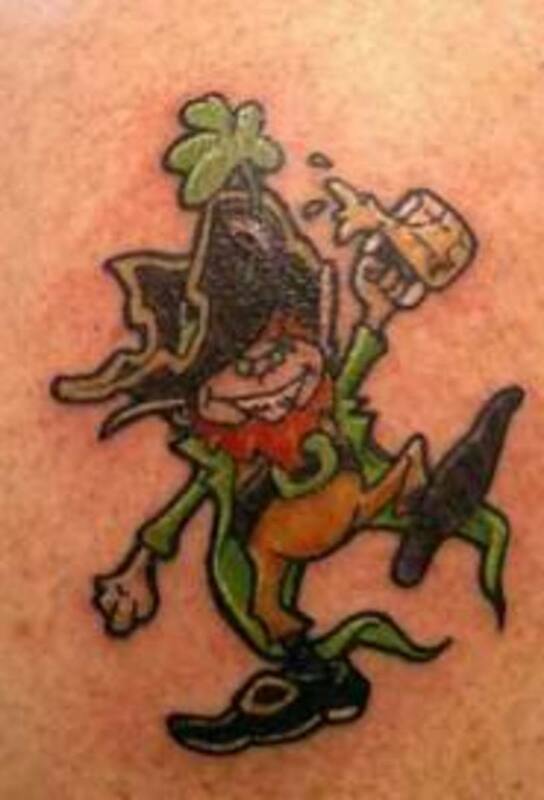 Although some leprechaun tattoos are real-like, most are done in a cartoon style tattoo. Learn about the symbolic feather tattoo. Awesome ideas, designs, and meanings. Learn about the diamond tattoo. Awesome tattoo ideas, designs, and meanings. Learn about the clover, shamrock, and leprechaun. 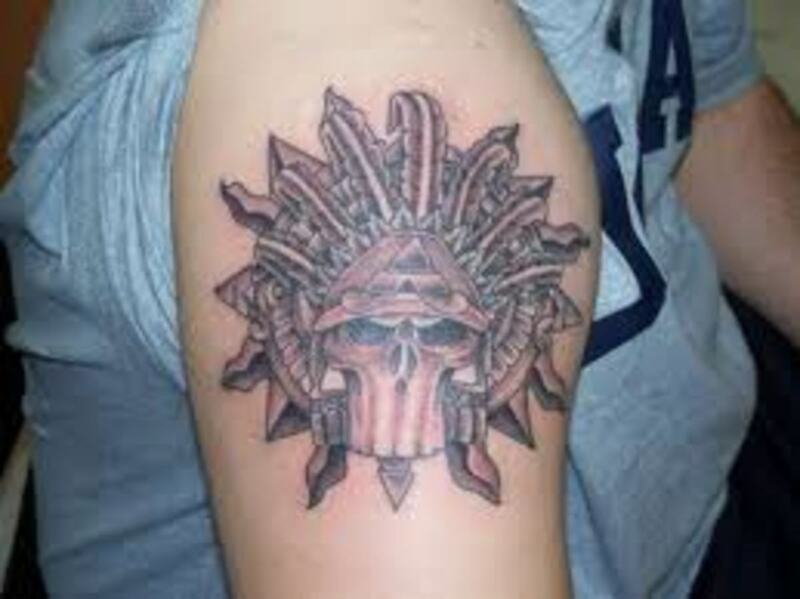 Cool tattoo ideas and designs of all three. Tattoo meanings for the clover, shamrock, and leprechaun. Learn about the cross tattoo and other religious tattoos. Find out what they all mean and represent. Great tattoo ideas for men and women both. Learn about the Celtic tattooing style. Learn all the different designs of the Celtic tattoo. Great Celtic tattoo ideas for men and women. Learn about the meanings of star tattoos and all the different variations of the star tattoo. Great star tattoo ideas for men and women. Learn about all the different styles of tattooing. Great tattoo ideas for men and women. Popular styles of tattoos. Learn about one of the oldest styles of tattooing. Great tribal tattoo ideas for men and women. Tribal tattoo history. Great tattoo ideas for men and women. Learn about the Pacific and Polynesian style of tattooing. Cctlitgirl, thanks for taking the time to drop by. Glad you enjoyed it and thanks for your comment and votes. Happy V-Day. Beautiful pics. This hub fits in perfectly with one I'm writing about St. Paddy's Day. Yes! Voted up and SHARING. Beth, thanks for taking the time to come by and for your visit. I am glad you enjoyed it. And to your question, yes I will. I will begin on it in the morning, well, in a few hours. I would never deny a request, in fact, I would be honored. thelyricwriter, another very interesting and -pardon the pun- eye-catching Hub! Hey, if you ever decide to do one about swan tattoos please let me know? I've been thinking about getting a swan on my ankle. Gypsy, same here. I remember being a child and trying to find them. I never found one, but my friend found 2 beside each other one time. It makes me question the good luck part cause she won $50,000 on a scratch off lottery ticket last year. It took 20 years, but it came true I would say. AE, thanks for coming by and for the comment. I believe the clover is a perfect way to show your Irish roots. I am glad you thought it was informative. Best wishes and take care. Alastar, thanks for coming by. That is a good point. If you get a clover tattoo, make sure it is from a good tattoo artist. Green is very, very hard to come out. Laser removal does cost a lot. Hate that happened to you Alastar. Wonderful hub! I've always liked things Irish like shamrocks and leprechauns. When I was little I was always trying to find four leaf clovers in the grass. Darn it lyric. These are some awesome clover tats. I let a parlor owner do mine who wasn't so hot and he made the stem too long. You know how hard it can be to get green ink out. Maybe sandblast it before paying the laser people $1,000 with no guarantee! Frank, thanks for dropping by and for your time, comment, and votes. Hope you having a good day. I agree, this generation and probably the upcoming one also are tattooed bound. I believe the understanding of all the meanings have did it though. This is a symbol that can represent their beliefs, their meaning. I am glad to educate others so they can see that some tattoos are done for meaning instead of beauty. HBN, thanks for coming back and for your time, votes, and comment. I am glad you enjoyed it very much. Hope all is well with you Gail. Have a great day and see you soon. Great hub! I really enjoyed reading about the symbolism behind the clover and shamrock tattoos and liked all the photos that you included. Donna, thanks for coming by and for the comment and vote as well as your time. 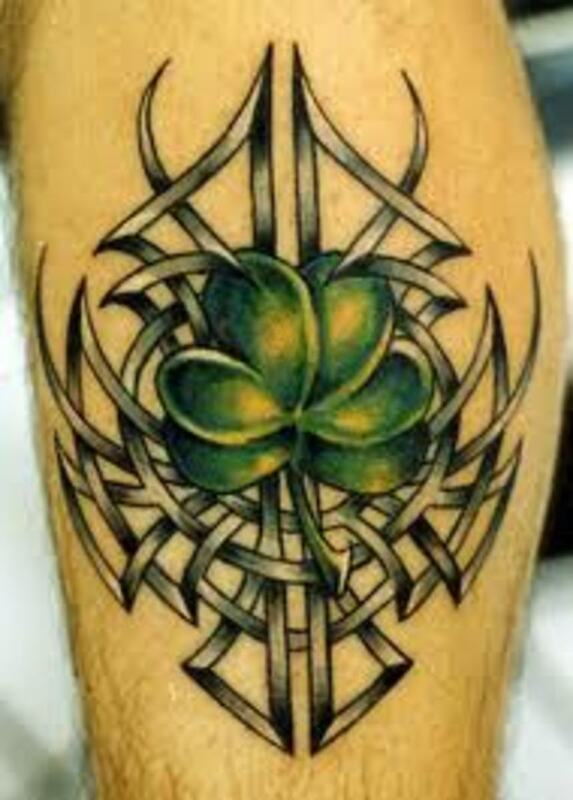 The clovers and shamrocks done in Celtic knotwork are great designs. Any of us could use some luck, right? It is a great design for someone who isn't sure what to get also. Leprechauns, I agree. They are a little on the spooky side. But then again, that is their character.